Our research has shown that the most important elements in the gold’s puzzle are: the real interest rates, the U.S. dollar, and the risk aversion (although its less seen in the data). It’s the Golden Triad of Gold’s Drivers (see the diagram below). Let’s analyze them. Diagram 1: Golden Triad of Gold’s Drivers. 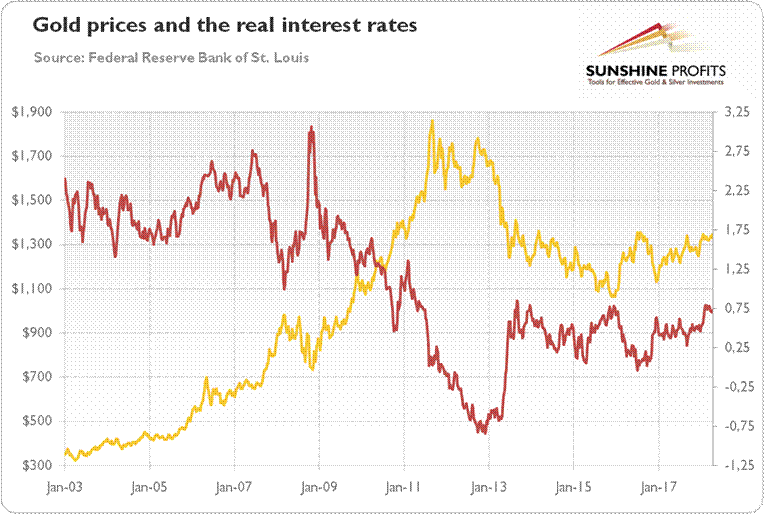 Why do the real interest rates matter for gold? Well, resources are scarce. Everything comes with a cost. Holding the yellow metal in a portfolio is not an exception here. Some costs are clear: storage and insurance of gold. But these expenses are not the main costs. The most important are the opportunity costs for foregone interests. Instead of holding gold, investors could be lending it (or the cash spent) out. The higher the real interest rates, the larger are the opportunity costs of investing in gold, so investors are less willing to hold a lot of the shiny metal (think about the 1980s and the 1990s, when Volcker increased nominal interest rates, pushing the real rates higher). And the lower real interest rates, the smaller are the opportunity costs, so people are more eager to hold more gold. In particular, the negative real interest rates are gold’s real friends (the 1970s or the post-Lehman era are the best examples). Gold is quoted in the U.S. dollar. So its price rises when the greenback weakens. And it declines, when the dollar strengthens. However, gold behaves like a currency, not a commodity. Therefore, when investors sell the greenback, it depreciates against other currencies, such as the Japanese yen, the euro, and gold. This is why we often see a positive correlation between the euro or the yen’s strength and the price of gold. Let’s confront it with the data. 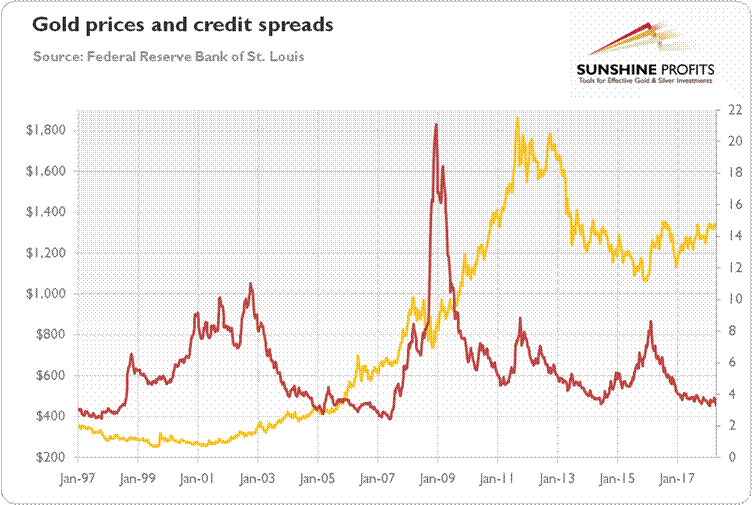 The long-term correlation (since 1997) between the credit spreads and the gold prices is 0.17. It is not much, but investors have to remember that it is difficult to quantify the risk aversion – credit spread is only an imperfect approximation. 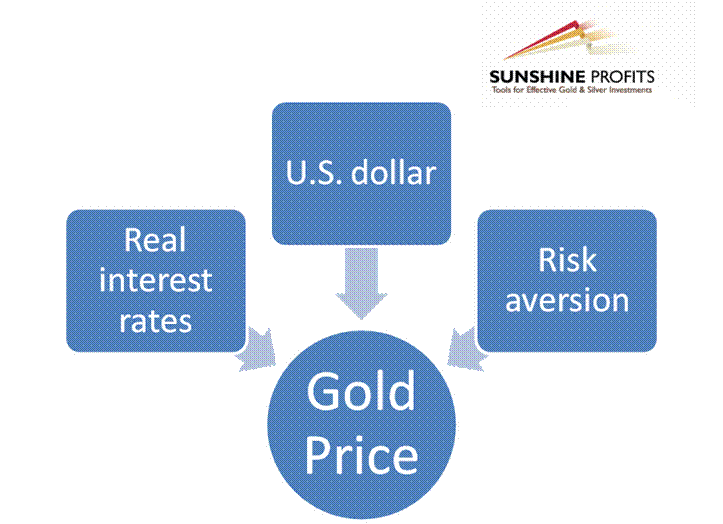 Gold demand depends on the investors’ psychological perception of the value of gold. Such market sentiment is in turn dependent on a myriad of interrelated variables. The most important are the level of real interest rates, the strength of the U.S. dollar, but also the level of confidence in the economy among the market participants (although it’s hard to quantify it). Low real interest rates, weak greenback and high risk aversion are bullish for gold. High real interest rates, a strong U.S. dollar and low risk aversion are bearish. Hence, when you invest in gold, omit the chaff and focus on these factors – the wheat of profitable investment in the precious metals. You can, for example, conduct the regression analysis. The simple regression which uses these three factors (weekly averages since 2003) explains about 86 percent of gold price variability. 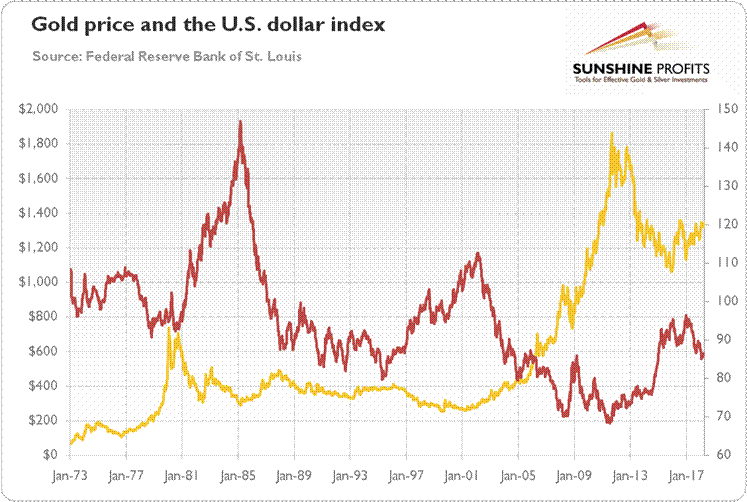 According to that model, the current gold prices are overvalued. It may be the case that there are other factors in play the regression does not cover – or that the yellow metal is likely to fall. You have been warned.